There's no stopping Great Eastern Entertainment's licensed Mega Man line. Hot on the heels of Zero and Rush, the next character to be immortalized in plush is... Bass! As one may recall, GE Entertainment were gauging the 'ol Rockman Corner comments for their next Mega Man plush goods. So here we are; a few months later your top three choices -- X, Zero and Bass -- have been realized with a few more to come. Bass will hit select retails later this summer. Got an idea for a feasible Mega Man product? The GE crew continue to be on the lookout. Drop them a line in the comments below. I know she wasn't the most popular character, but an Iris plush would really make my day. Thank you. I, myself, would very much enjoy a Mr. Prog plush. Give the Battle Network series some plush love. Likewise a Mr Hertz would be the bomb and an instant buy for me. Anything wearable with Zero's logo (like that sweet wristcuff you released a while back) would be awesome. The Maverick Hunter crest in a wearable form would be pretty cool, too. I would LOVE an Iris plush too! Yes! Rock Volnutt and Roll Caskett plush toys for everyone! GE make it happen. I'd really love if GE made a poster out of the cover art of Mega Man Xtreme (Japanese version used the same artwork). A lot more of Haruki Suetsugu's art in general would be great in poster form. I dig the X4 poster they released. Also, it'd be nice to see more logo merchandise to go with the existing Repliforce keychain, like something with the Sigma "Σ" insignia. X, Zero and Bass were the top three, huh? I sure hope people don't start to think that all Megaman fans are emoting weeabos. Count me in for Iris! But what I'd really love is Vent/Aile in human form. I'd also buy a Servbot. Definitely. I'm not a huge Battle Network fan, but I'd buy Mr. Prog, if I'm thinking of the right little guy. Once upon a time I thought his name was pronounced like the fish. A Volnutt, Servbot, Treble, or Duo plush would be alright with me. Might be reaching a little with that last one, but I liked him. 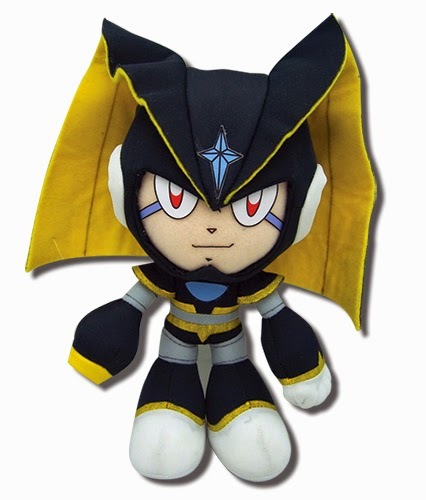 Also, I'm gonna have to bite, and buy this Bass plush. I can't resist. There have only been four Mega Man plush sets ever. Classic series Mega Man 4 era: (https://www.youtube.com/watch?v=mAzwOCAGnx8) - had Mega Man, Proto Man, Rush, Dr. Wily, Pharaoh Man, and Met. The next was Powered Up, which had several sizes of just Mega Man. San-ei recently released Mega Man, Proto Man, and Rush, and those are great. Then, this set. So, we have a huge opportunity to expand! Classic series that have little merch and no plushes: Dr. Light, Roll, Beat, Auto, Eddie/Fliptop. Tango and Eddie would be my first choices. Tango is a GREAT choice, as he has no merchandise other than an unpainted figure from Japan. Zero from Mega Man Zero and Copy X would be fun, as would Vile and Sigma from the X series. Got to admit this took me by suprise. After doing three characters from the classic series and moving onto X, I was expecting them to finish with Axl, or after the oddly specific X4 comment, Iris. Not that I'm complaining, it's nice to see the classic series hasn't been ruled out after the first three. I'd so be on board for Iris and Mr. Prog dolls. The concept artist for the GE plushies thus far would totally make these 3 look mega adorbs. Bass.EXE, I love the design so much. A little cloak included. Amazing work GE, Bass looks like he'll be huggable to the max! Please add Roll (Rockman 8) next!